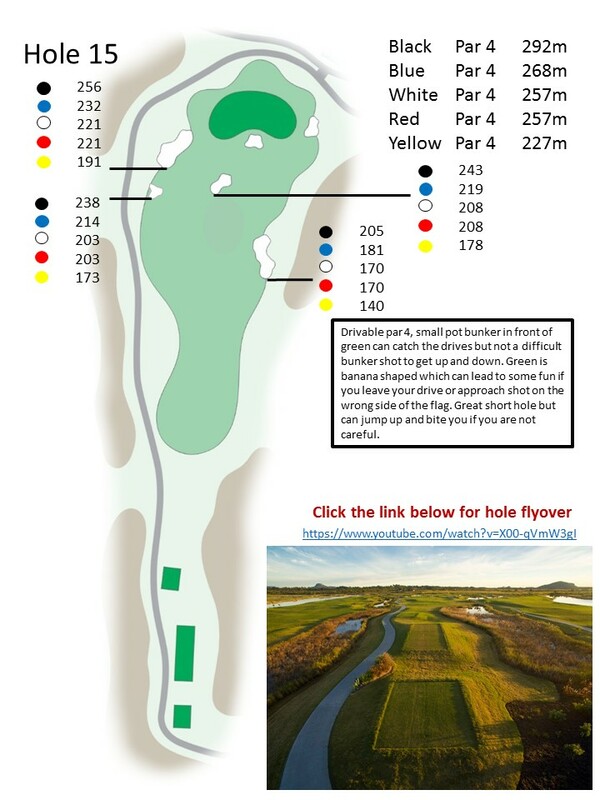 Strong par 4, the tee shot needs to avoid the bunkers on the right, a good tee shot will require a medium to short iron in to a long narrow green, bunkers short left and a large trap on the right of the green will catch an off line approach shot. 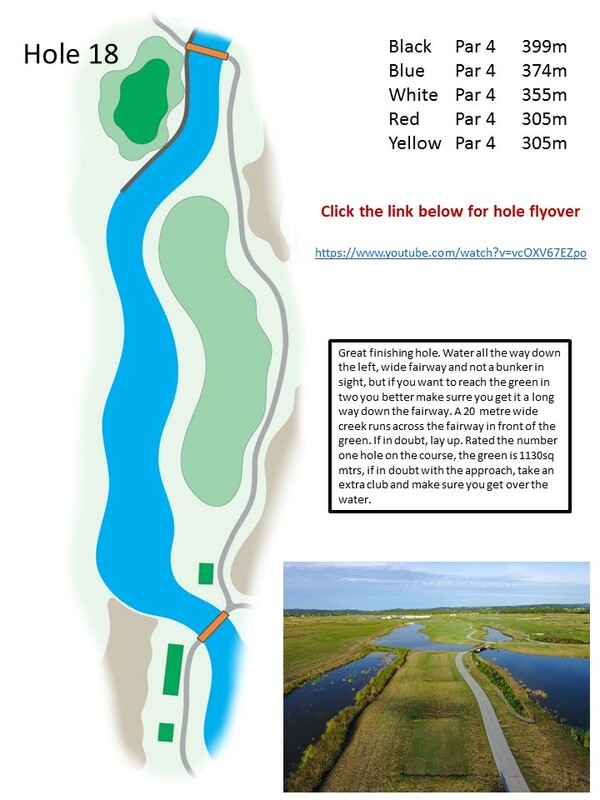 Anything long left will leave a difficult up and down, green slopes from back to front so anything past the pin, will leave a quick downhill putt. 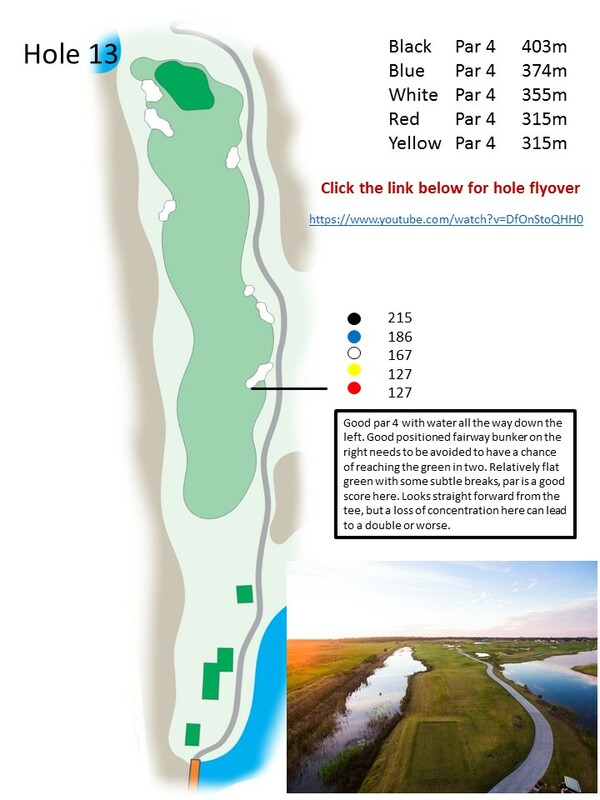 Short par 5, the drive needs to avoid the left hand fairway traps, a good drive over the bunker down the middle will leave a long iron or rescue to the green. The green is raised with steep slopes off the the left and behind as well as bunkers left and right guarding the green. If you are laying up, best to lay up on the right hand side of the fairway, this will leave an easier approach shot in. Nice par 3. 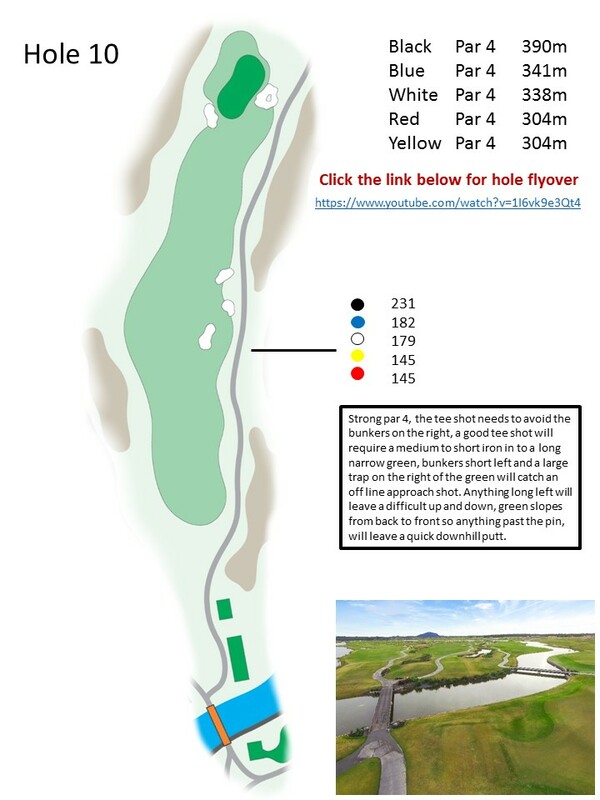 Long green is surrounded with bunkers, the trick here is club selection, if the flag is at the front and you get too sneaky and come up short, chances are you will run back down the slope into the water. 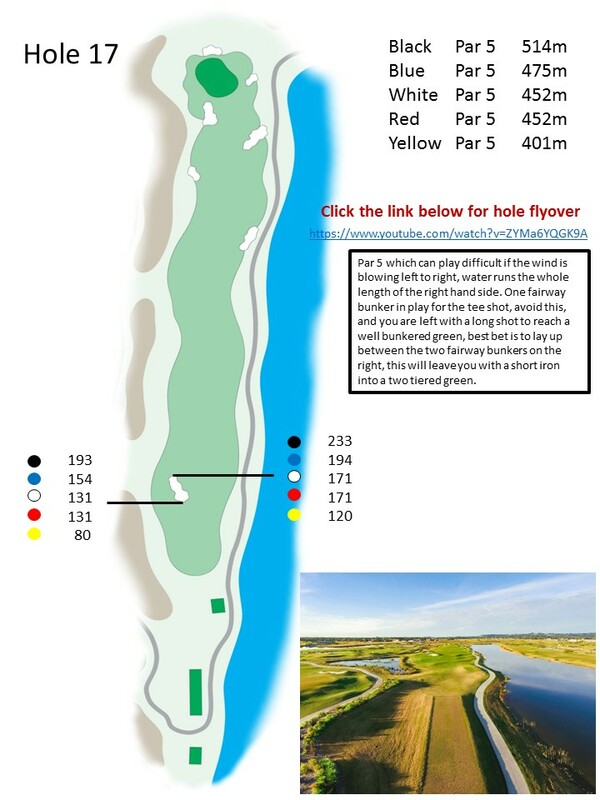 The green is 35 metres long, so add one more club for a short pin and take the par. Good par 4 with water all the way down the left. Good positioned fairway bunker on the right needs to be avoided to have a chance of reaching the green in two. Relatively flat green with some subtle breaks, par is a good score here. Looks straight forward from the tee, but a loss of concentration here can lead to a double or worse. Another strong par 4. No fairway bunkers but water running the whole length of the fairway left. The tee shot needs to be right to left, otherwise you can run out of fairway and end up in the hazard. A well bunkered green leaves a difficult second shot into a small green, anything left of the green will leave you well below the putting surface with a difficult up and down. Drivable par 4, small pot bunker in front of green can catch the drives but not a difficult bunker shot to get up and down. 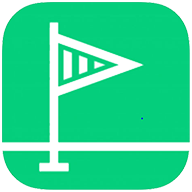 Green is banana shaped which can lead to some fun if you leave your drive or approach shot on the wrong side of the flag. Great short hole but can jump up and bite you if you are not careful. 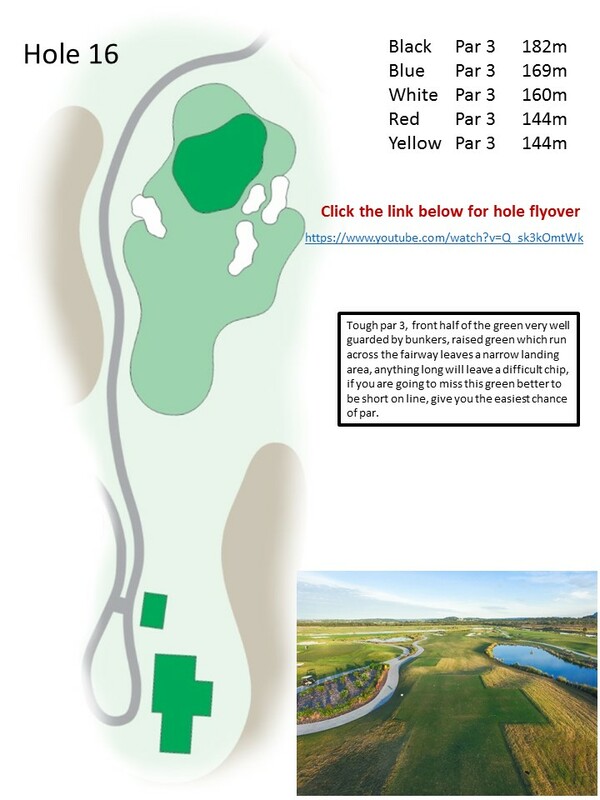 Tough par 3, the front half of the green is very well guarded by bunkers, the raised green runs across the fairway and leaves a narrow landing area, anything long will leave a difficult chip. If you are going to miss this green better to be short on line, to give you the easiest chance of par. 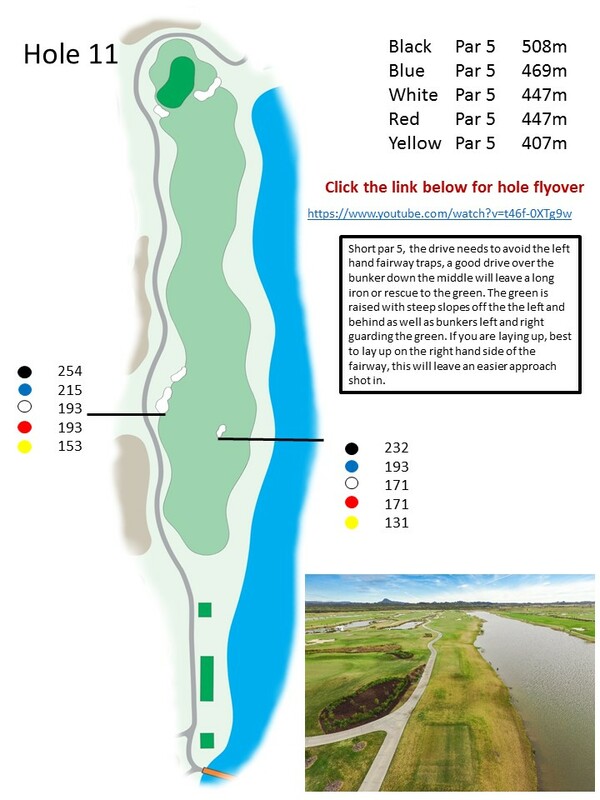 Par 5 which can play difficult if the wind is blowing left to right, water runs the whole length of the right hand side. 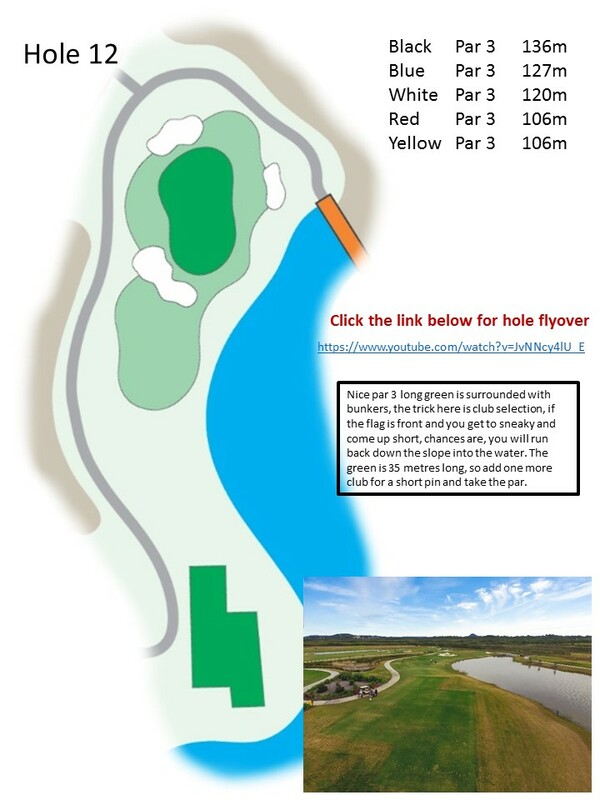 One fairway bunker is in play for the tee shot, avoid this, and you are left with a long shot to reach a well bunkered green, best bet is to lay up between the two fairway bunkers on the right, this will leave you with a short iron into a two tiered green. Great finishing hole. Water all the way down the left, wide fairway and not a bunker in sight, but if you want to reach the green in two you better make sure you get it a long way down the fairway. A 20 metre wide creek runs across the fairway in front of the green. If in doubt, lay up. 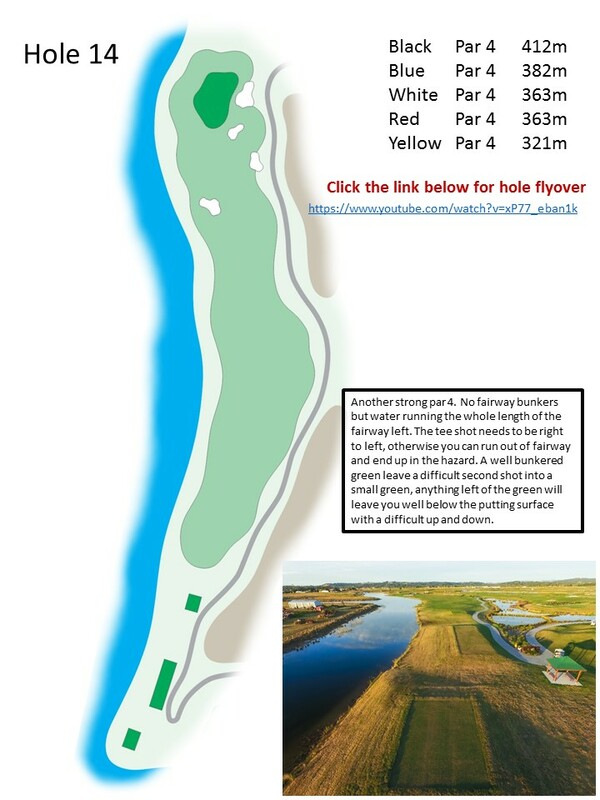 Rated the number one hole on the course, the green is 1130sq mtrs, if in doubt with the approach, take an extra club and make sure you get over the water.